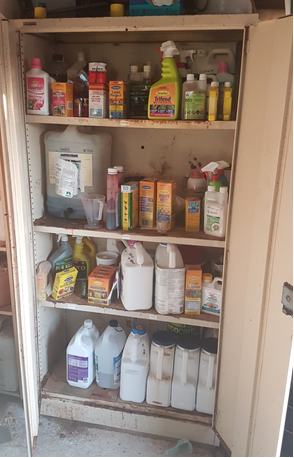 Last week a NGIQ member of QFF had a first time visit from WHS inspectors targeting their compliance with the laws on storage and handling of any hazardous chemicals, and they were subsequently issued with an Infringement Notice and a $3,400 fine for not having a register listing all the chemicals in their storage (a small cabinet – see picture below). It is understood that in December 2018 the department mandated that when an Improvement Notice is issued an Infringement Notice is also automatically issued (on a select range of matters). Even though this was a small family business, as they are registered as a company they have received a corporate level fine. The Compliance Monitoring and Enforcement Policy Workplace Health and Safety Queensland December 2018 is available here. Queensland District Court decision of Andrew McHugh v BKE relating to liability for a quad bike accident. The key is that the judge decided that “the quad bike was inadequate for use in mustering on the property, there was a foreseeable risk of injury which the [farm] did nothing to adequately control. It did not exercise reasonable care to make the quad bike safe to ensure [the operator] was able to undertake the task of safely mustering the cattle.” Significantly, the judge expressly stated that the failure to provide a CPD, seatbelts, an alternative vehicle (e.g. a side-by-side), or to conduct a safety audit were all important components of the breach. The judge accepted that, given the operator’s experience riding quad bikes and knowledge of the terrain — i.e. growing up on a farm and living near the site of the incident — his own negligence contributed 20% to the injury. However, that was “significantly lesser in degree than the [farm’s] breach in providing … dangerous vehicles regularly involved in fatal incidents even with experienced drivers.” Judgement was entered for the operator in the amount of $400,000. Following this decision it’s possible that any farm which allows someone to use an unprotected quad bike will bear common law (as opposed to worker comp) liability for any injury which the user suffers as a result of an accident. This would certainly extend to employees, but arguable anyone who uses their quad bikes with permission.